League - It looked as though it was going to be another disappointing season. At the half way mark, we’d picked up a respectable 37 points from our 19 matches, but we were in 4th place, and more importantly 10 points behind run-away leaders Lecce. However, in the second half, we were once again magnificent. 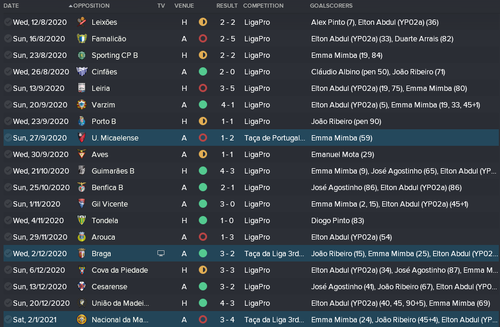 Bit by bit we gained ground on Lecce, and with about 5 matches to go actually overtook them to lead by 1 point. We couldn’t pull away though, with Lecce matching our every result. With 2 matches to go I thought I was about to have the most stressful final match of the season for a long, long time. 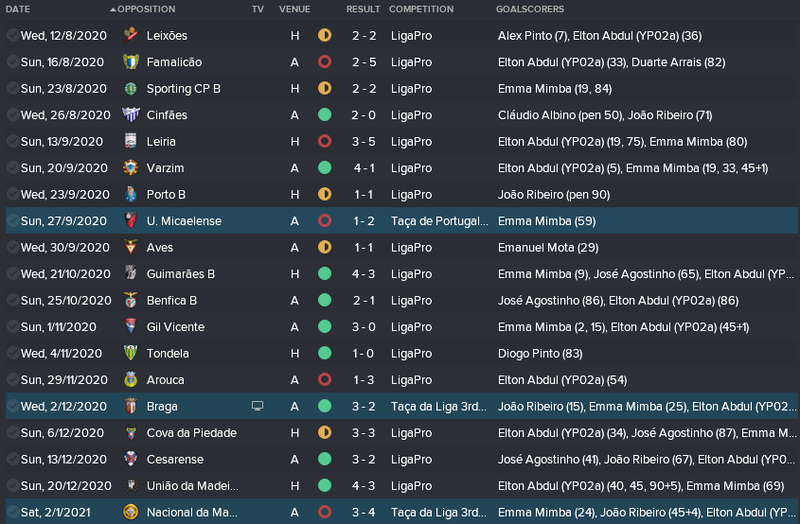 However in the penultimate match, we won 4-0, Lecce lost 3-0, and we were champions and promoted. Nervous breakdown averted. 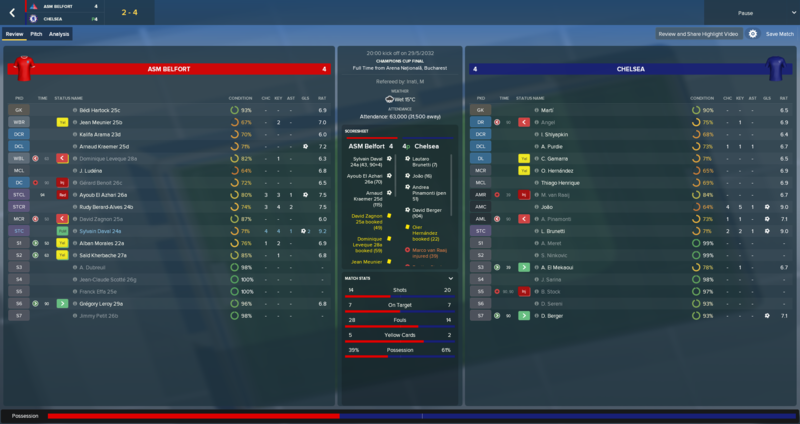 I was disappointed not to win the Serie C Supercup, which we finished second in to Cremonese who picked up 17 fewer league points during the season. Mind you, it was just one of those fluke results, and it’s not as though it really matters. 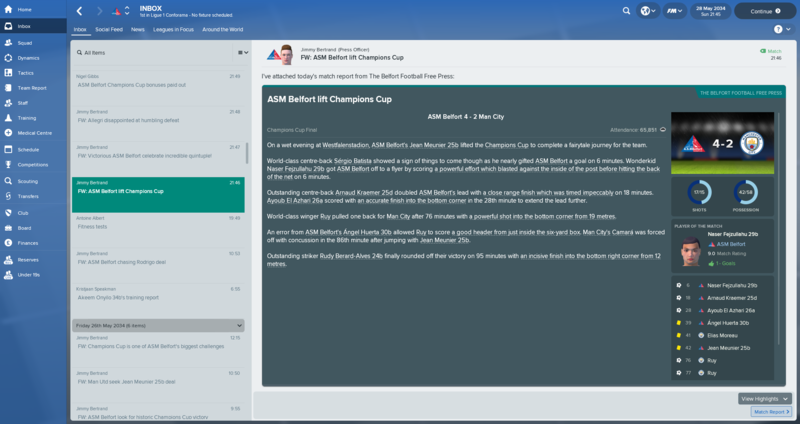 Del Zotti picked up a 4-5 month injury as well, so the Super Cup is not one of my favourite trophies. 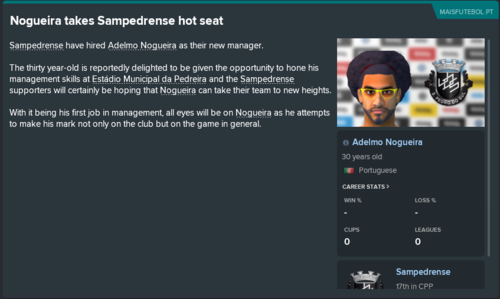 Gaining promotion in a youth challenge is always a bit dangerous of course. If we fail to stick the landing, and go straight back down, all our players may leave. Frankly I wasn’t too disappointed on missing out on promotion the first 2 seasons, though we could have done financially with going further in the playoffs. MVP – Davide Cardea – Cardea is still only 21 years old, but he spent the first half of the season on the subs bench because I have so many strikers with his current potential, and vastly better potential. However he became a starter in the second half of the season and ended up with 31 goals despite only starting 23 matches. As was the case 2 seasons ago, a few of those were penalties, but he did have a great half season, that being the half when we won 17 of our 19 league matches. Mind you, he was rubbish in our 2 Supercup matches. Youth – Just one 5 star potential here, but I think that’s more to do with the degree that the team as a whole has improved. 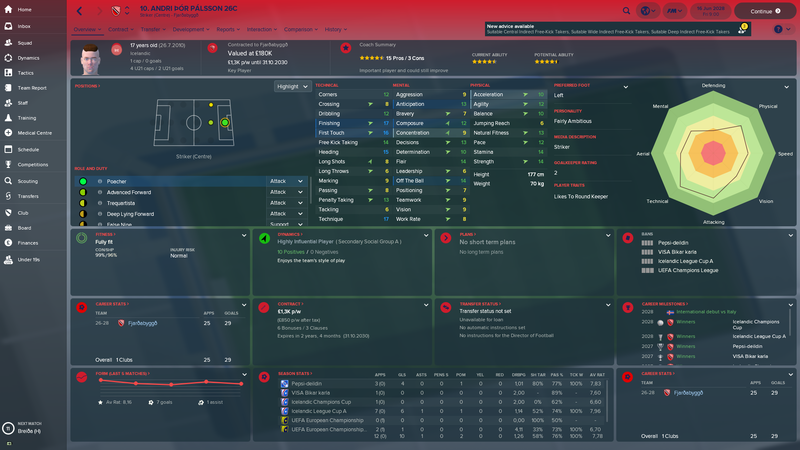 Davide Salvi (YP3a) isn’t really good enough to play for the first team yet, but did appear in the penultimate and start in the final league matches once we were sure of promotion. Didn’t play well, but hopefully will develop. Regarding youth development generally, 5 of my current first team are under 20, so I’ve achieved promotion without compromising building for the future. Transfers – I lost last season’s MVP, Ricci, for £750k and 50% of his next transfer which hopefully should pay off for us at some point. Next season my main concern isn't staying up, (though we really, really need to do that), it's getting rid of our £1.3 million debt, which would be a lot bigger if the Chairman hadn't put money into the club a few times to reduce it. Even though our chairman doesn't actually exist, I really want him to get his money back, and of course to be able to improve the facilities and send staff, especially me, off for qualifications. 18/19	Serie C/C				4th		Reached playoff quarterfinal. 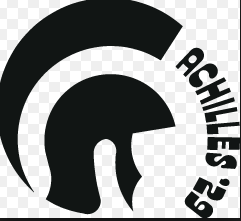 19/20	Serie C/C				7th		18 pts in first half of season, 47 in second. Reached playoff second round. 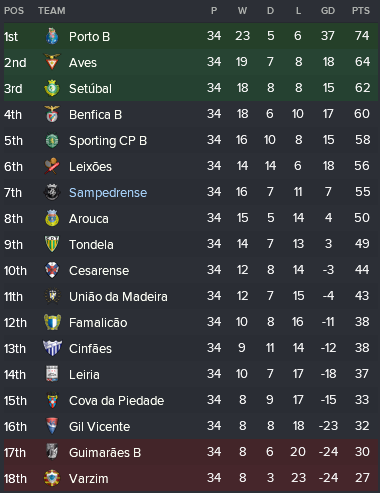 20/21	Serie C/C				1st		Promoted as champions. We were comfortably cruising through at home and in Europe, whipping round PSG and winning CL knockout ties 4-0 and 3-0. I thought well, this year it must be in the bag. 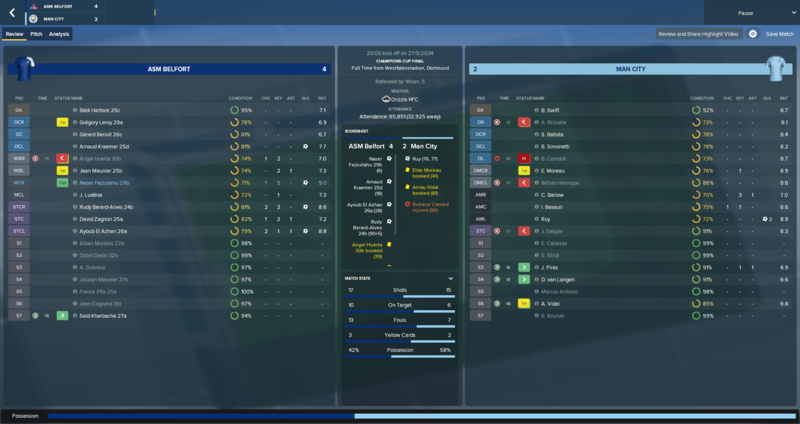 Then the CL final against Chelsea, and they go 2-0 up in the first 20 mins with two Maradonna-style wondergoals (really, like one of their players dribbling through my whole defense and finishing, twice…). We pull it back to 2-1 just before half time, then give away a stupid penalty for 3-1 down in the 51stminute. I change tactic, we play better, I’m feeling proud. We pull it back to 3-2, then 3-3 with literally the last kick of normal time. Chelsea are down to 10 because of injury. Ok, now it really is in the bag, I think. Then my best player, El Azhari has a Zidane moment and sees red for a mad tackle one minute into extra time. It’s 10 against 10. Chelsea score, but again we peg them back from a corner with 5 to go. I already know what’s coming because my regens’ penalty taking attributes are rubbish and surely enough, Chelsea cruise through on pens. 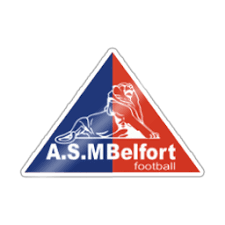 This Belfort team is absolutely blasting it at home and in Europe, but they do seem to be complete bottlers in the big games. Even the French cup finals are a struggle, but this is something else. I hope I win it next year, otherwise it’s becoming one of those painful saves, like my world cup exploits in the Ultimate Challenge last year. At least for the CL, I don’t have to wait 4 seasons until the next one. 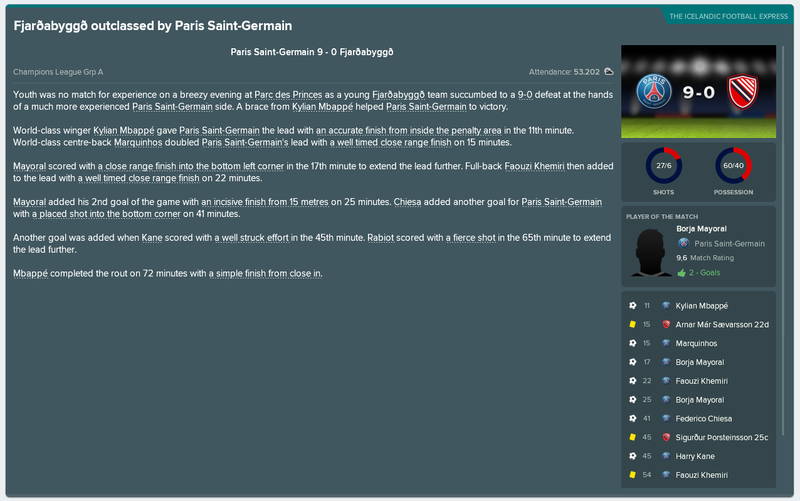 League: Utterly dominant, and PSG were rubbish for a change. Long it may continue. Youth watch: Two players from the intake three years ago are making a claim for first team football. Gregory Leroy 29a (DC/MC) looks a great prospect, but his personality has taken a hit. Naser Fejzullahu 29b (AMC/ST) has, on the contrary, been tutored to a better personality, but his performances are a bit hit and miss so far. 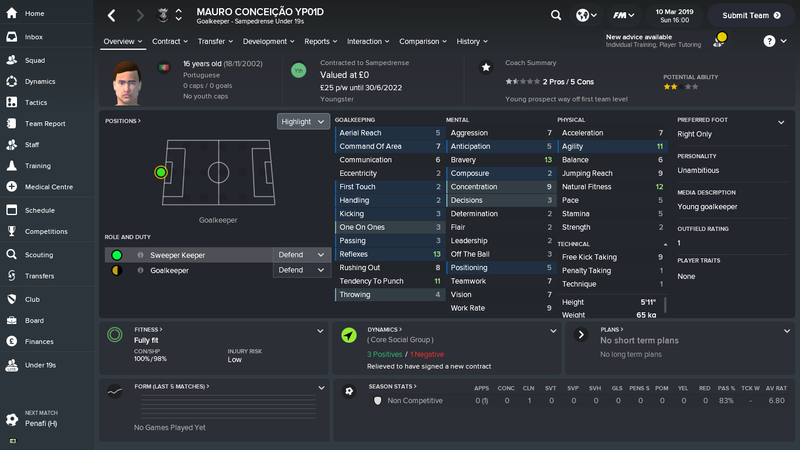 Youth intake | Frank Boateng 32a (MC/MR) | Djibril Diallo 32b (D/WB/MR) | Matheo Martin 32c (GK) | Marcelo Caceres 32g (AM/STC) An actual golden generation! I don’t think I’ve had this good an intake since the one in season 6, 7 years ago, which gave me four of my current top players. 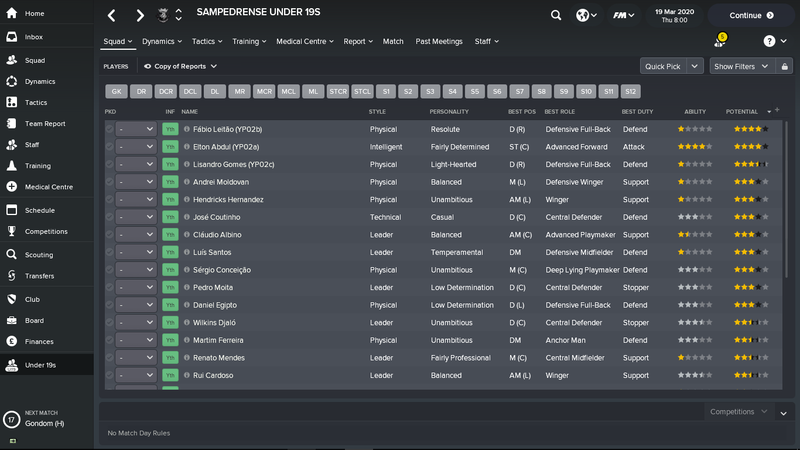 The position spread is good to, with some center mids and defenders, and it’s nice to have some foreign-born players through my feeder clubs in Ghana and Chile (although officially only the Chilean regen Caceres came through the feeder club). For some reason some of the screenshots didn’t save, so I re-took them at the end of the season. 2020/21 |  National |  1   |   R9    |   n/a       |     n/a     |    Valade (24)          |  David (13)            |    David (7.6)            |  Promotion! 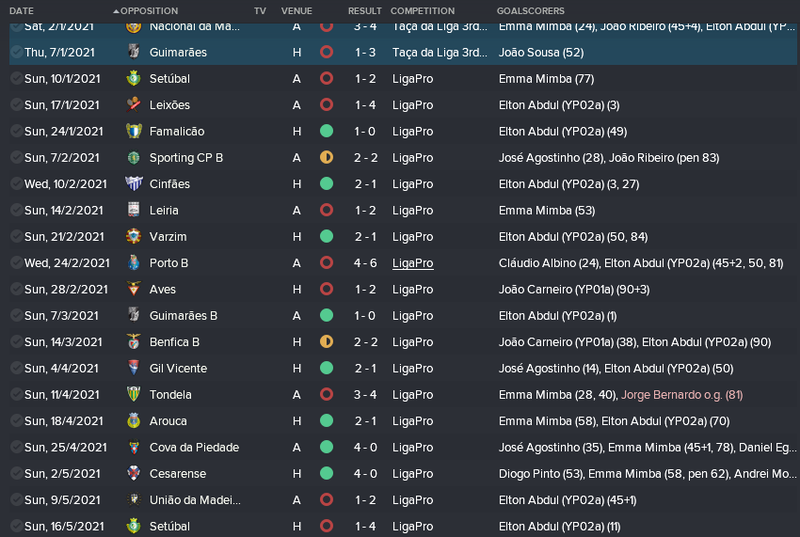 2023/24 |  Ligue 2  |  1   |   R9    |   n/a       |     n/a     |    Valade (24)          |  Martins (14)          |    David (7.4)            |  Promotion! @dkouv Having only recently emigrated to this challenge, I haven't been following this save, so.... ouch. You know I've beaten your Ultimate Challenge ACON record now, with 10 in a row. (And for those who can't pick it from context, that's not winning it 10 times in a row). Your saves and posts are becoming increasingly scary, I must say. @XaW Hope you're enjoying the save. Trying to make progress from such a small nation sounds like a nightmare. Do you think that you are improving the Icelandic national team with your players. Maybe there's not enough of them yet. @vikeologist thanks for the commiserations, although in fairness your ACON exploits sound far more painful... That's 20 years of hurt right there. I think it was @Fadedaf with the ACON record; my specialty was failing in World Cups, and as close to the final as possible. There is a little bit of my brain that starts hurting even now that I think back to that. With this save, it's still reasonably early days, and so far the main danger is to the integrity of my laptop screen rather than my sanity. Congrats on the promotion with Taranto, and good luck in Serie B! I sure am enjoying it! The thing about Iceland is that the seasons are so short, so it's not a drag to complete them. And I knew what I were getting myself into, so I expected a long road that I might never finish! Andri Baldursson 25b is a very solid defender, though he lacks something in the air. Rúrik Vilbergsson 26a is only 17! But still a massive defender with few glaring errors. His heading is subpar, but with that good jumping, it's not that big of an issue. In other news, I made a huge sell. 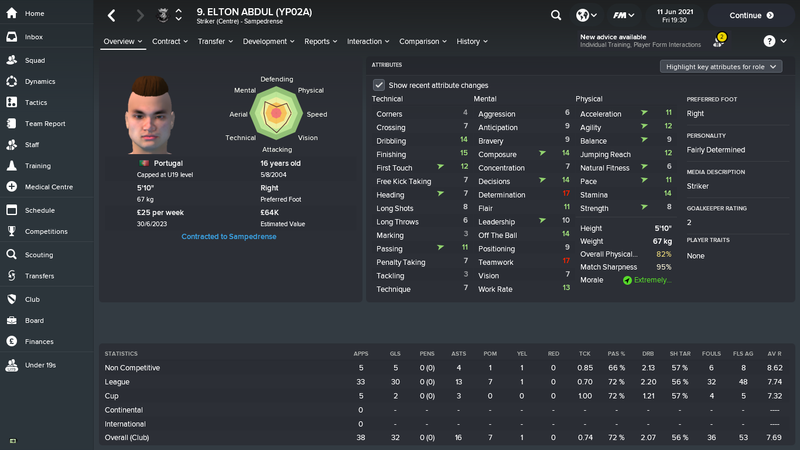 One of by best strikers have been targeted for a while, and I got a bid that was good enough for me to sell. Mostly because I have a lot of good strikers who can take his spot. We have started to become a domestic powerhouse now, as I expected. Though we had to take a couple of more years than I had hoped, we are finally here. Not much to say about the league as we won it comfortably, as I expected. We did lose two and drew a game. Hopefully, we can go unbeaten soon. In the domestic cups we won it all. 3 out of 3 possible to have another domestic sweep. Europe is the thing that matters. We once again had a go in the Champions League and we started in the 1st qualifying round were we knocked out FK Zeta of Macedonia. Then in the 2nd qualifying round we beat BATE Barysaw of Belarus. In the 3rd qualifying round we got past Malmö FF of Sweden before passing the final hurdle in Basel of Switzerland to reach the group stage. Here we had a very tough draw when we got Napoli of Italy, Dortmund of Germany and Paris Saint-Germain of France. 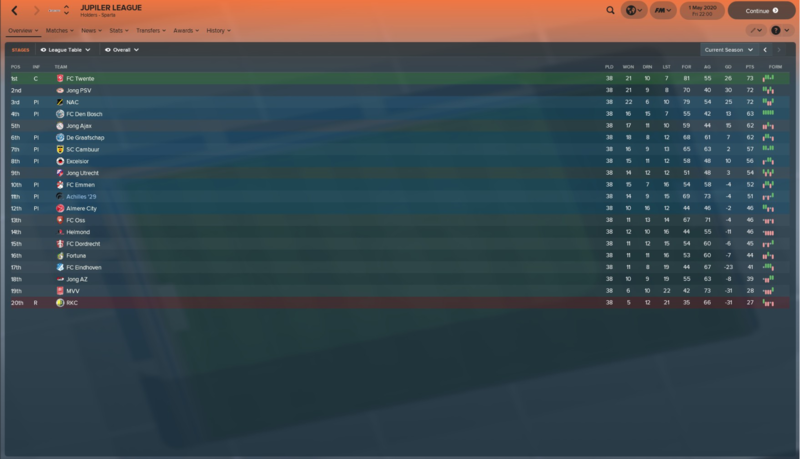 We lost the first 4 matches, but managed to beat Napoli at home and drew away to Dortmund. This allowed us to finish 3rd and head into the knockout stage of the Europa League. Here we drew Hoffenheim of Germany. We beat them 4-3 at home, and then countered in a massive 6-1 win away. In the 2nd knockout round we got Valencia of Spain. A fantastic 3-1 away were followed up by a 1-2 loss at home, but still enough to put us through. In the quarter final we got another Spanish side in Athletic Bilbao. We narrowly lost 0-1 at home, but they showed their quality by beating us 4-2 in Spain and knocked us out. Money money money! Getting to the group stage of the Champions League really bring in serious cash. We are improving our facilities and I think I'm close to maxing out youth recruitment and coaching, at least I don't have any possibility of asking to improve it further, but I'll check in every once in a while to see. I'm still working on my Continental A licence, and the Pro one is up after that. 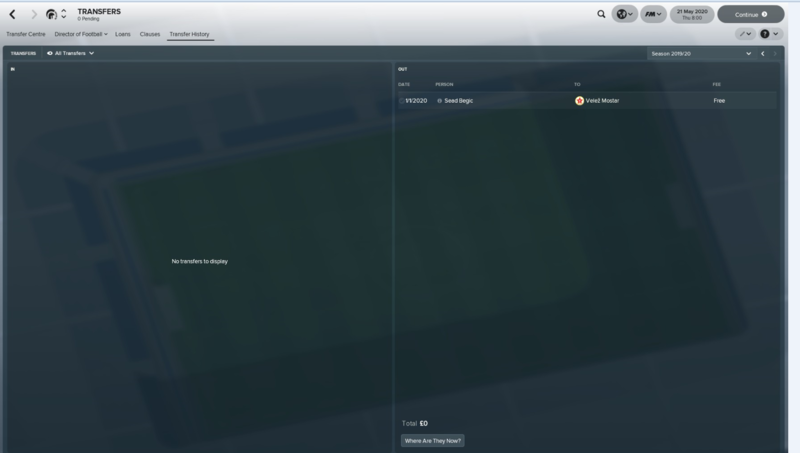 We are also getting our new stadium after the next season, a bit over 9k capacity. Should come in handy! 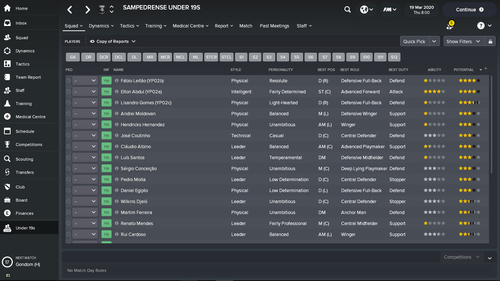 The youth intake this season weren't as good as before, but it was filled with non-Icelandic players. Good to get a variation of nationalities. The best talent seems to be the German striker Claus Strangl 27a. Sigurður Þorsteinsson 25c is actually a rotation option for us, so I were quite surprised when he got the game for Iceland. Not that he is not a good player, but Iceland have better. League -Newly promoted, I was concerned that we might get relegated straight back down and lose all our best players. Well, we didn’t get relegated. We won the division to make it back to back promotions. We had a few wobbles, including a spell when we lost 4 of 5 matches. However, we were promoted with 2 matches to go, and champions before our last. Both promotion and the championship because of other teams losing, which was a bit anti-climactic, but I’m not going to complain. I’m shocked. I’m not even sure if it’s a good thing. I’m now even more worried about being relegated and losing all our best players. Top Goalscorer – Adama Diakite– 22 Given that we won the division basically because of our 122 goals, it’s a bit surprising that the top guy only had 22. 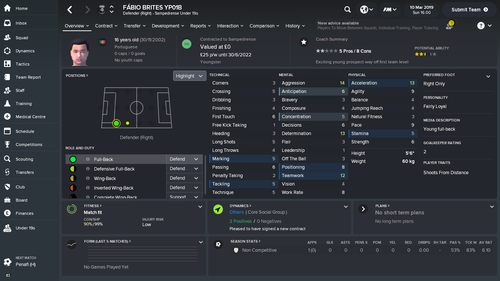 Top Average Rating – Martino Perina (YP1b) – 7.66 A midfielder, and our best player. Has 3 seasons left on his contract, and no release clause, but I doubt he’s going to want to hang around that much longer. 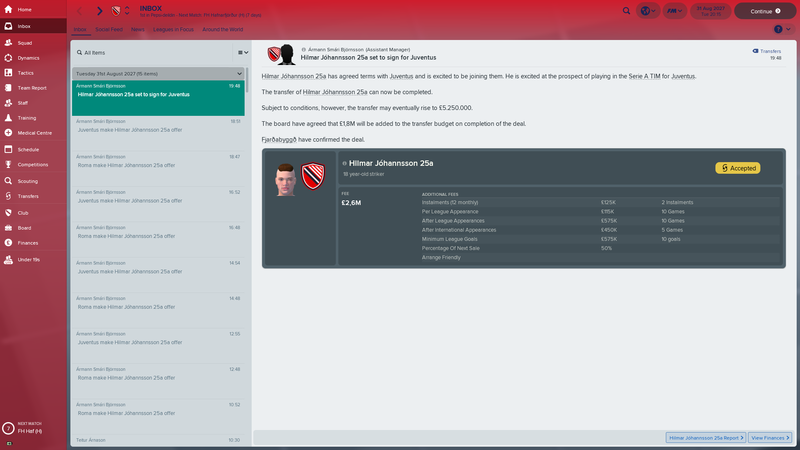 Tried to extend his contract even more, but he asked for more than we can pay at the moment. Youth – Hopefully Massimo Moramarco (YP4a) will become a good player as he plays in our weakest position. He wasn’t good enough to get any first team opportunities yet though. I tagged 3 other players, more in hope than expectation. The main youth development in the first team was the introduction of Roger (2c) in goal. I have a few promising goalies, and had to give one of them a chance at some point. 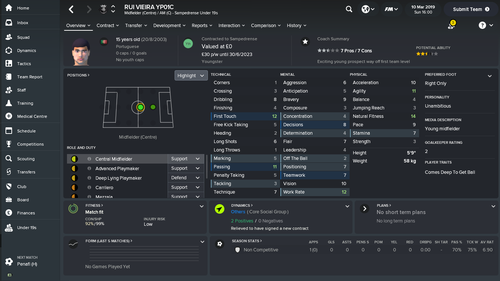 Transfers – I sold one of my best players, Leonardo Del Zotti (YP0a) because we received a good offer, and we have a lot of good strikers. 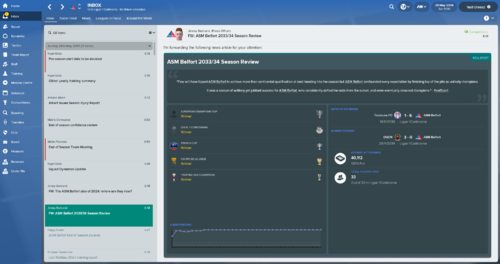 We were slowly reducing our debt, but selling Del Zotti allowed me to clear it and get on with putting coaches including myself on coaching certificates, and improving our facilities. With the large prize for finishing in the top 3 in Serie B, our facilities are being improved across the board for the first time. Next season could be tough. Or we could win the league. I mean, who knows? 21/22	Serie B					1st		Promoted as champions again, much to my surprise. Wow, straight to Serie A! Nice going @vikeologist! With this rate you will have the challenge completed in a couple of seasons! Than in Earth is that intake how you manage that xd? Well, I have managed to get feeder teams in most of the countries we got youth from. Though I have a lot of them for a couple of years, so I don't expect that many foreigners in all intakes. 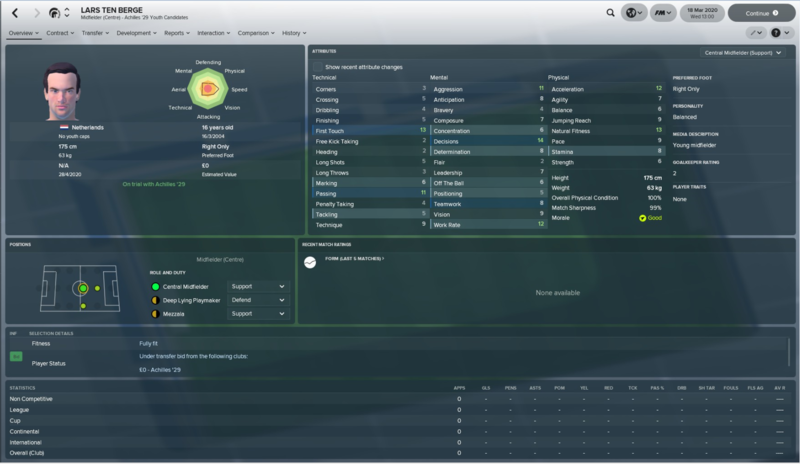 I always try to get foreign feeder teams and negotiate them to add youth aspects. 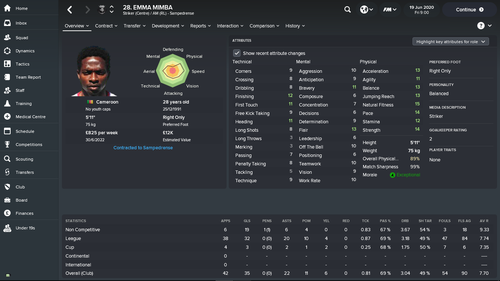 It's always fun to get foreign players, so it's something I try to do in all clubs. Another young player got his debut, in the European Championship even! Andri Þór Pálsson 26c have emerged as an excellent striker. Getting capped at only 17 years old. I really hope I can keep him. League/Cup: Won the league easily, and out to PSG in the cup semi. 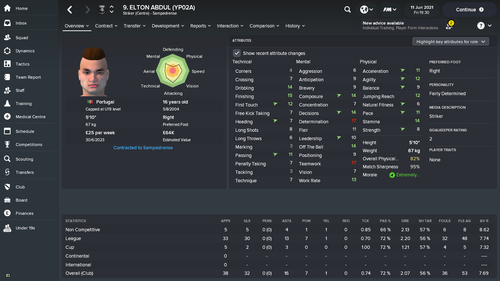 Youth intake | Noah Robin 33a (ST) | Achraf Amrani 33b (AMRLC) | Loic Bailly 33c (M/AMC) Looks like another potentially good intake, but I am now bursting with attacking talent from bottom-up. I could do with a few defenders in the next intake! 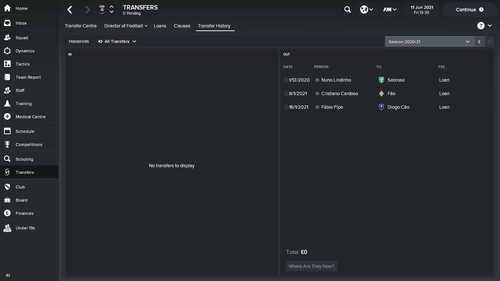 Nice to get quite a few players through my feeder clubs again. In other news, Azhari 26a (AMLC/ST) has won the Golden Ball. I'm just about to start this in Northern Ireland. I have noticed that there is a transfer already arranged to come into my team. Is this ok, as I can't seem to find a way of cancelling it. It's fine. 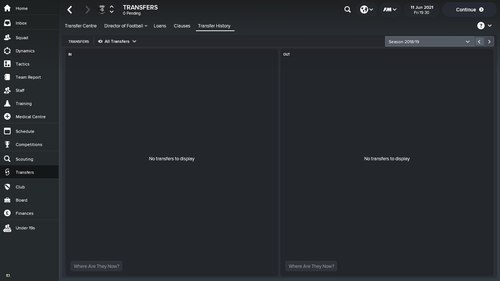 Just post a screenshot of the "arranged transfers" you get when you take over and everything should be ok.
League – After 2 straight promotions, I was even more worried about relegation than last season, but it turned out that the season was just super-boring. We were never in danger of relegation, and never really anywhere near Euro qualification spaces. 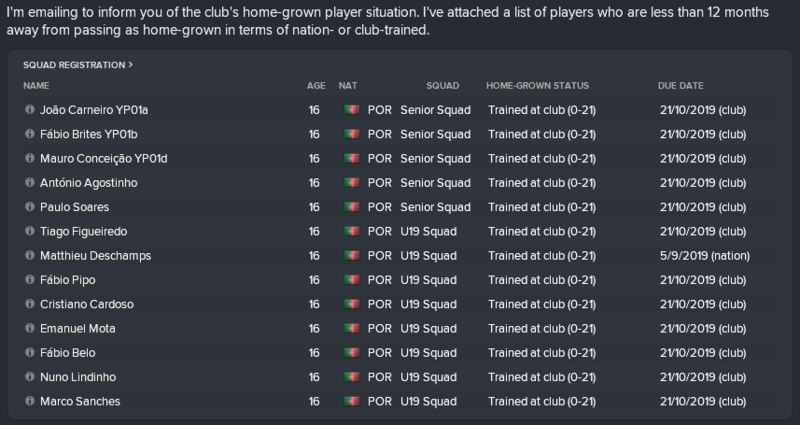 At least this meant that I could drop some of my young players in the first team at the end of the season, but the first team basically is youth intake anyway. Top Goalscorer – Davide Cardea - 25 Our usual top striker, Diakite, wasn’t up to this division at all, and he’s now been dropped, almost certainly forever. 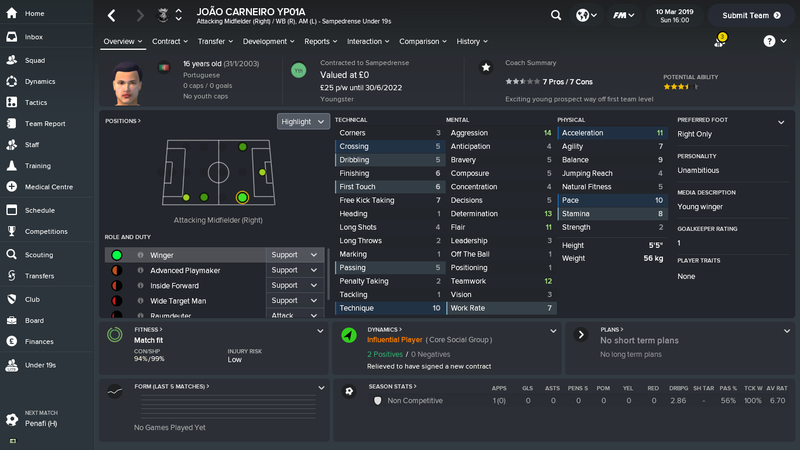 Cardea, even though he’s only 23, is never going to improve from his current mediocre ability. He did score 18 goals in 29 league starts, (he scored a lot in the cup against lower league sides), but we’re a high scoring and conceding team. We scored the 2nd most goals in the league with 89, and set a Serie A record conceding 90. Top Average Rating – Nicolò Bottero (YP2a) – 7.50 Our best striker, though he doesn’t score that many goals, and is more like an advanced winger with 25 assists. He won the European Golden Boy, but still hasn’t made a senior international appearance. In fact the only player to even make it into a senior international squad is my duel-Albanian nationality goalie Roger, but he hasn’t made it off the sub’s bench yet. 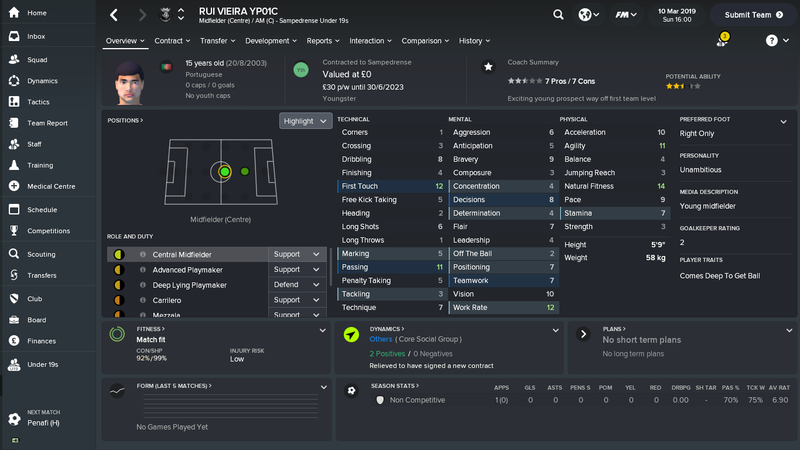 MVP – Martino Perina (YP1b) – According to my coaches, still by far my best player. 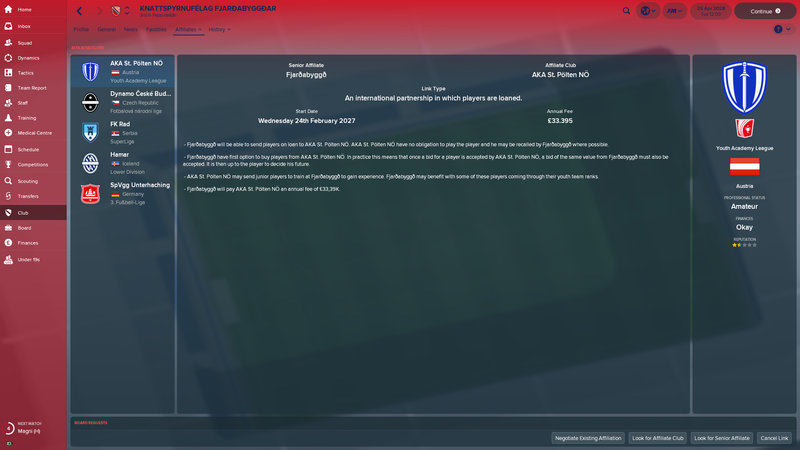 Has 2 years left on his contract, and even though he will negotiate a new contract if I promise him a big pay rise, I can’t afford the salary he insists upon. Hopefully next season. Hard to say just how essential he is. It doesn’t really show up in stats, because he’s a central midfielder, and doesn’t score much or get a lot of assists, but I definitely don’t want to lose him. 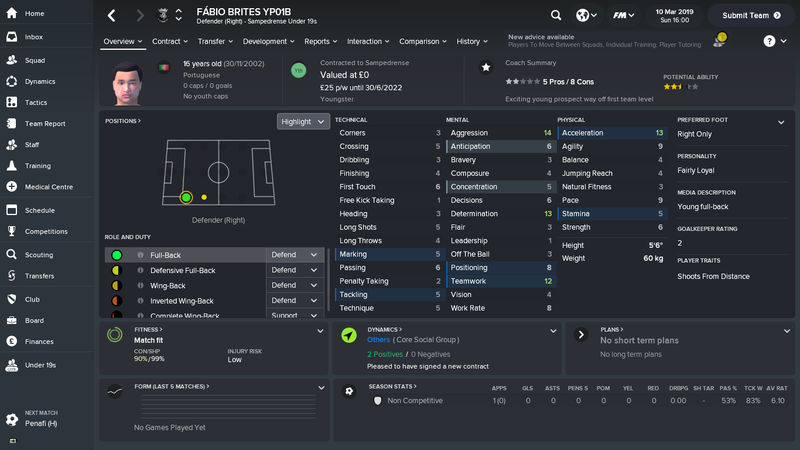 Youth - With the money we made winning Serie B last season, we were finally able to start improving our facilities and coaching qualifications, and this seemed to pay dividends in this year’s youth intake. A few 5 stars and Elia Maggiore (YP5a) is the first one to come through with a promising designation. Unfortunately I’m going to have to play him out of position as a central midfielder, where I threw him in for the last 6 matches of the season. He didn’t do very well, but hopefully it will be useful experience. Corona (5c) is also ‘promising’, but he’s stuck behind my 4a left wingback who also has 5 star potential. There’s quite a few players who are just never going to get a chance because they’re stuck behind an equally promising player. 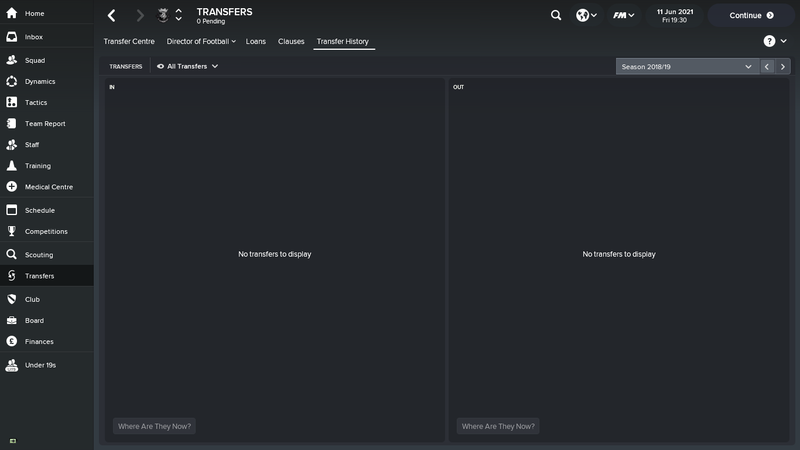 Transfers – Absolutely nothing to report. I didn’t even sell any dead weight, though I did release lots of players. 22/23	Serie A					9th		Boring (but profitable) season. I started this challenge again, this time in Iceland. 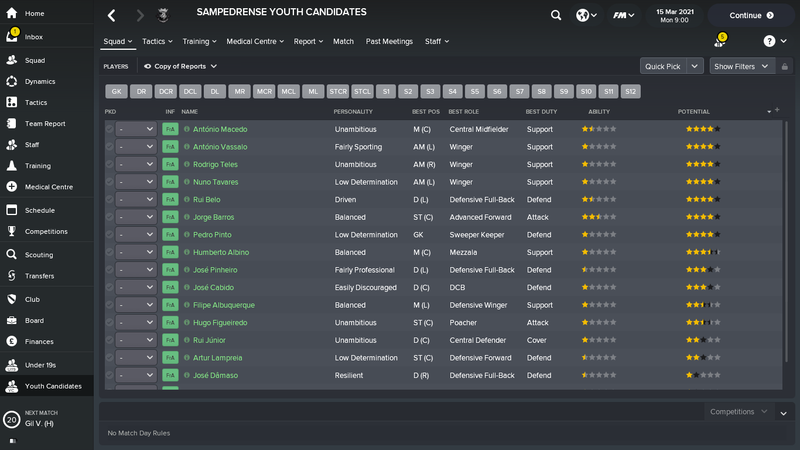 After finishing the first season I've had no youth intake. I looked at the clubs facilities and noticed that they have no junior coaching and no youth recruitment. I take it this is the reason why I had no intake? To make matters worse, the board won't improve them either as we don't have the funds! We completed a clean sweep of trophies with two domestic cups and the league title. As you see, since I've had so many good strikers come through the intakes, in the end the line-up is quite attacking, with three strikers up front, two retrained strikers at center mid, and two retrained wingers at wing back I did play a bit more defensively against City, but not by much A special shout goes out to Angel Huerta 30b (WBR) and Naser Fezullahu 29b (MC), who both only became first-team regulars towards the end of the season, with Huerta especially surprising me with his progress. Both had a great game in the CL final, and came through my affiliate clubs (Racing Santander and Basel), which adds an interesting twist to the whole thing. 2033/34 |  Ligue 1  |  1   |   Won   |   Won       |    n/a      |    El Azhari 26a (33)   |  Berard-Alves 24b (24) |    El Azhari 26a (7.9)    | A quintuple, and most importantly the CL! @dkouv Congrats. Maybe now there's a happy ending to your story, it will stop my nightmares, and I'll climb back on board this challenge at some point. I think I do need to switch between the 2 challenges (this and Ultimate) even though that makes it likely that I'll not complete either one. So is there no hall of fame? Have many people completed this challenge this year? I only started following it when I started the challenge myself. I'm not done with Iceland, but real life have stood in the way of gaming the last weeks, so it's going slower than before at the moment. @vikeologist Thanks, I'm happy that I may have provided a dose of inspiration for your challenge And if not, at least eased the nightmares, before you start having your own CL runs. 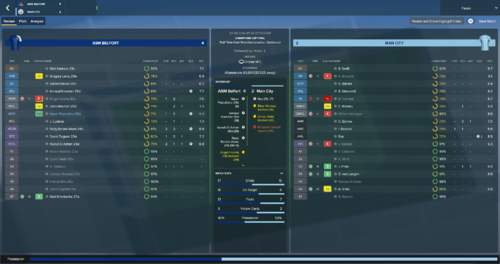 Don't think there is a hall of fame, but I think a couple of people have completed it this year, if memory serves me right - think it was a South American save, and an 1860 Munich one... For me, all the reward I need is not having to play in another CL final with Belfort. 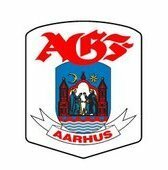 I will try my own country (Denmark) and the club I have chosen is Boldklubben 1908 (B1908). Always nice to see someone managing in Denmark. Good luck! Just a question: why is it mandatory to " Only load the Nation you’re managing in﻿ "? 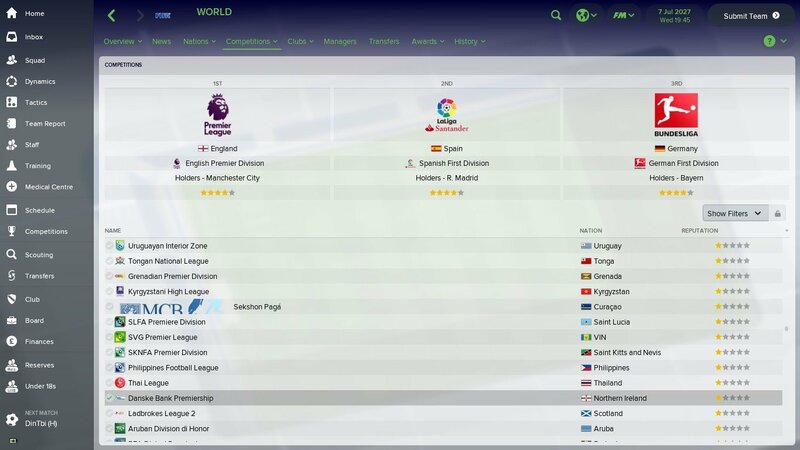 Since I'm looking to have the most realistic world and transfers possible I play with many leagues loaded and this rule is keeping me from partaking in this challenge. It's always been like this, I guess. Same for dafuges and the others. Though, dafuges have allowed loading other leagues the last few years, so maybe this should allow it as well? What do you think @darren1983? Unless ri or Braumiller returns you are the commanding officer here, so your call. I think the original intent behind it was so that everyone, no matter their computer, could have a go at the challenge and that everyone was playing it within the same kind of parameters. We already took it from Europe to the world this year so think that's enough change for now but from 19 onwards maybe we can have people loading extra leagues if they want. Ok, I understand. 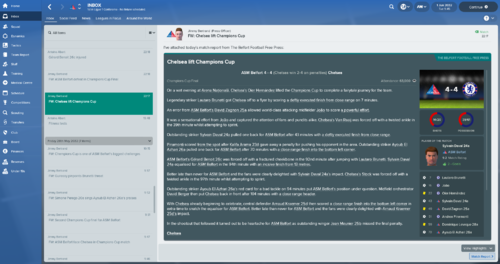 See you at the FM19 Youth academy challenge then. GL guys. What about non-original leagues? I would like to try this in Gibraltar or San Marino or Faroe Islands or some of these kinds. Cant believe how quickly this challenge died this year, and how few pages we seem to have compared to previous years I have only had one short(ish) attempt this year, at San Marino when i got bored of the problems of constantly havign my entire team on INT duty So time for another try. 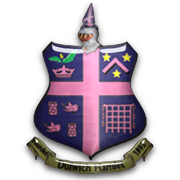 Dulwich Hamlet Season 3 2020/2021 ! League 2: A really strong start like every year (13/1/1 in 15 games). 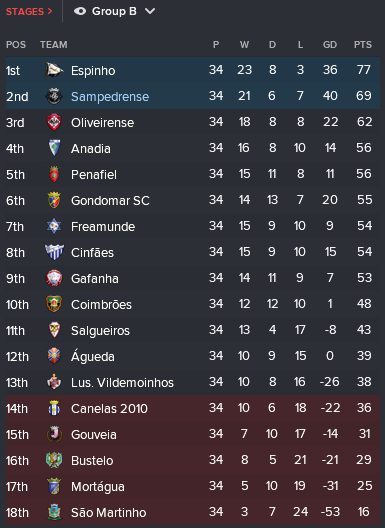 I managed to stay at the first place, half of the season. The second part is always more complicated. Even then, i had an opportunity to win the league with the last game of the season. 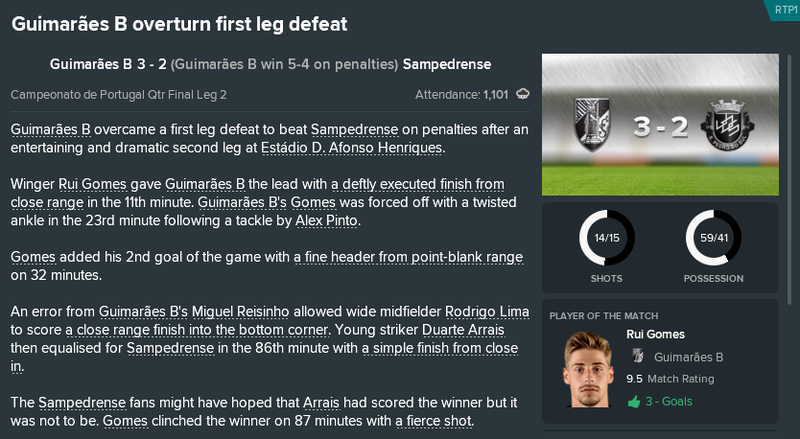 Unfortunately, an early red card (25min) made me unable to win it this time. We finish third with a promotion. Cups: Given the really high rythm during the first part of the season, i only sent my B squad in the cups. 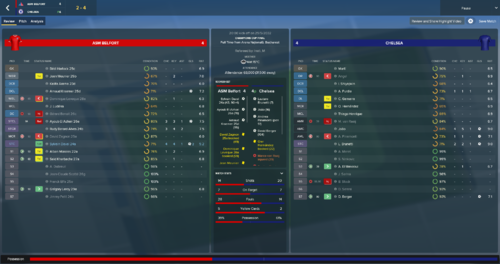 Suprisingly, in the FA cup, my B squad beat Crewe (league1) and gave me the chance to play against Newcastle at home. Squad: This season represents a big evolution. The regens are now the main part of my first team. I noticed several players improved their big games and regularity hidden note. Im really happy about it. Also, Faal set up a new average rating record for League 2. Transfer: Several loans for young players. They didnt progress as expected, i will release them at the end of the season. 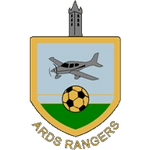 I will try to find an VNLS club affiliate to send my young players get some experience. 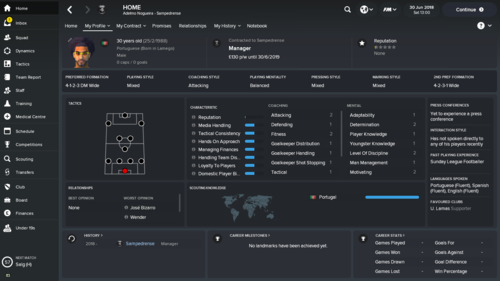 My best player would like to leave for a bigger club. 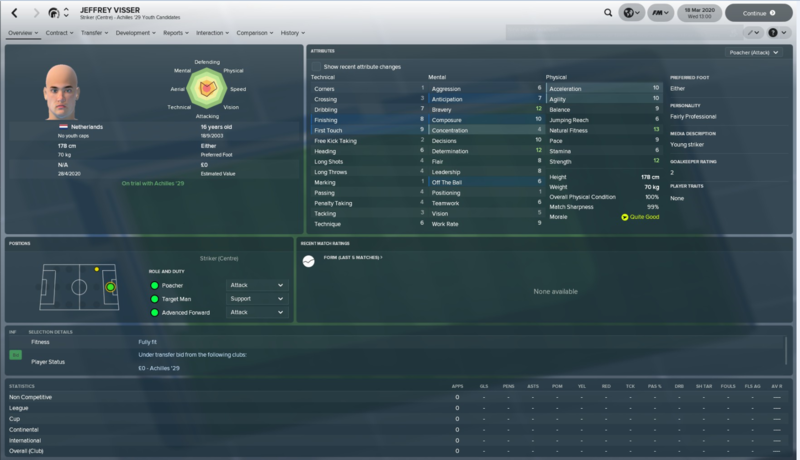 I still have a 2years+1 contract, and so far he is ok to wait for regens to grow up. Facilities: Improved youth facilities. 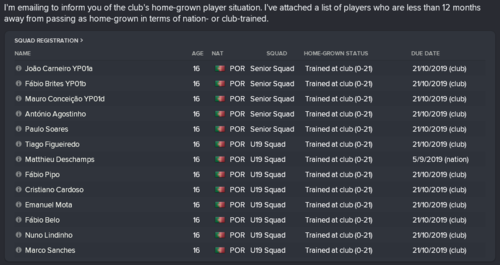 The youth teams cost me a lot of money, around 150k€/month (twice the player wages lol). 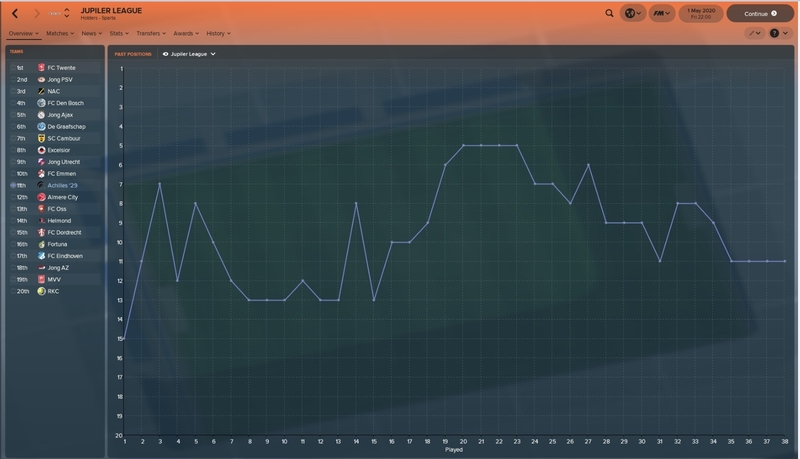 I hope to increave my revenue now I'm in League 1. I might be in trouble otherwise. Youth 2021: A good year. Several youngster already good enough to be substitute. I lack good central defender. Its my only concern, i have a lot of quality at the other positions. Surprisingly enough, the odds for league 1 are better that what i got in VNL and L2. 450:1 Prognosticated last, like every season lol. 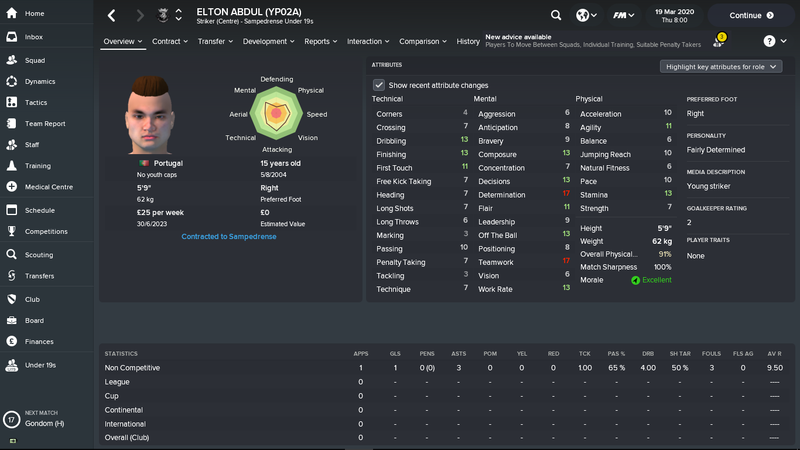 But its a real improvement and a sign that my regens are growing. Quite a surprising first season. We shot out the blocks pretty quick and were never in relegation danger and at the half way point, were in the top 7 and around the playoffs. With the odd fact that about a quarter of the league are "jong" ("B") teams who cannot go up, it was a bit confusing. Second half of the season we tailed off a bit as injuries kicked in, we lost our main striker for 2 months and had only dross to replace him. Somehow though, despite dropping lots of points, we managed to get into the playoffs despite not even finishing in the top half! 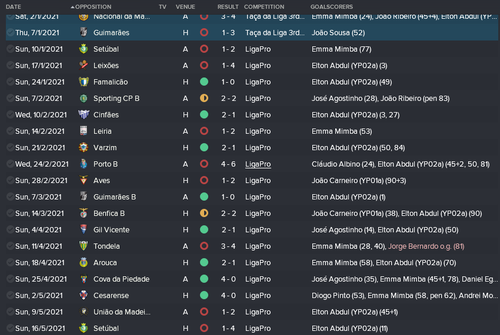 In the playoffs, we suffered heart break at the first hurdle when a 92nd min goal in the second leg put us out. We were through on away goals until then We are no where close to ready for promo so was not too gutted. 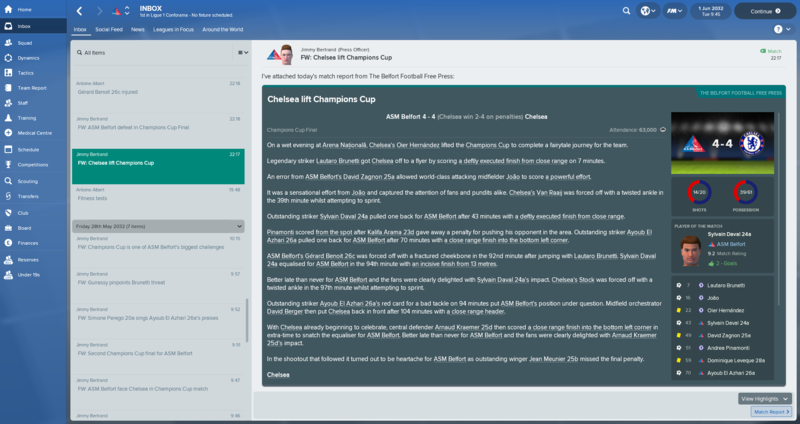 Got upgrades to YRN and JRN coaching during the year, and also secured youth and training upgrades next year as we are £1.8m in the black, which is rare in this challenge! The squad is paper thin - literally just 11 players, three of whom already want to leave. The first season will be the toughest by far. Reporting in with a quick update. Took over A.C.R. 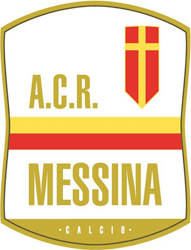 Messina in the serie C/C. I really have big respect for you guys, because what is this challenge hard. First season we had to fight untill the last playoff game to stay in the competion with a away draw, after winning at home. In season 19/20 we finished 14th, but we should've finished a lot higher. I have a good midfield and attack, but my defence is terrible. This results in many mistakes and I still am looking for the right balance in my tactic. I do have some bright talents though. Unfortunately my striker was sold in the winter transfer period for 450k€. I expect they will sell this summer some players as well, because we are making losses. Partly because of the big 30.000+ stadium. Well, we started with a squad of 11 players and a number of grey men, which made life very interesting. We actually started brilliantly thanks to our excellent front two of Wigor and Mimba scoring lots of goals, but we were much patchier in the second half of the season once suspensions started kicking in. 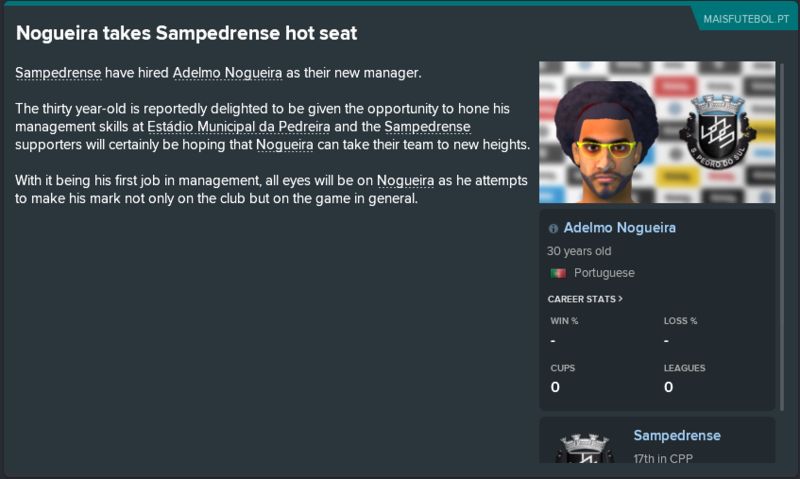 It got even more bizarre once the youth intake came in as the game got rid of the grey men, but the ridiculous rule requiring 12 players in the match day squad to have played for 3 years in Portugal meant that I was going into the last two months of matches with just two subs... (it allows you to get around it by leaving spaces on the bench). Clinging on to 2nd place was no surprise, but we were in dreadful form going into the playoffs. Cup - no screenshots, but we made it to the 3rd round, which is one further than the board asked for. 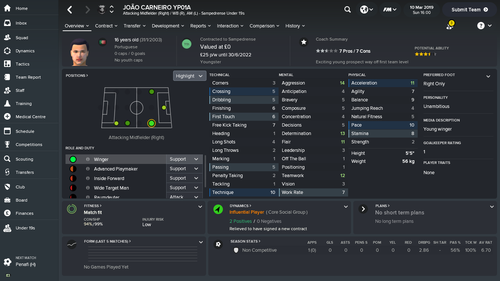 Joao Carneiro - YP01a. A pacey winger with decent potential but lots of work to do on the other stats. Fabio Brites - YP01b. A solid enough looking right back. Rui Vieira - YP01c. Boy did I need a centre mid. Lots of work needed on the mentals and defensive side, but he could develop into a playmaker of sorts. 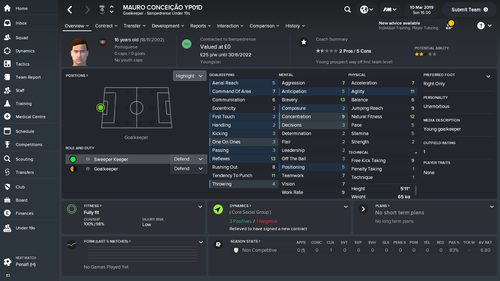 Maurio Conceicao - YP01d. We needed a goalie. This simply cannot come soon enough. 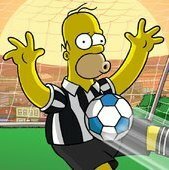 Currently able to name two subs per game due to the stupid rule...! Champions again relatively comfortably. Made it to the UEFA Cup group stages again. Big success. And training and recruitment upgrades as well. League (Results 1 | Results 2 | Cups | Europe) - Champions for the fourth time in a row. Fantastic. Moreover, we made it to the UEFA Cup Group stages yet again. Unbelievable. 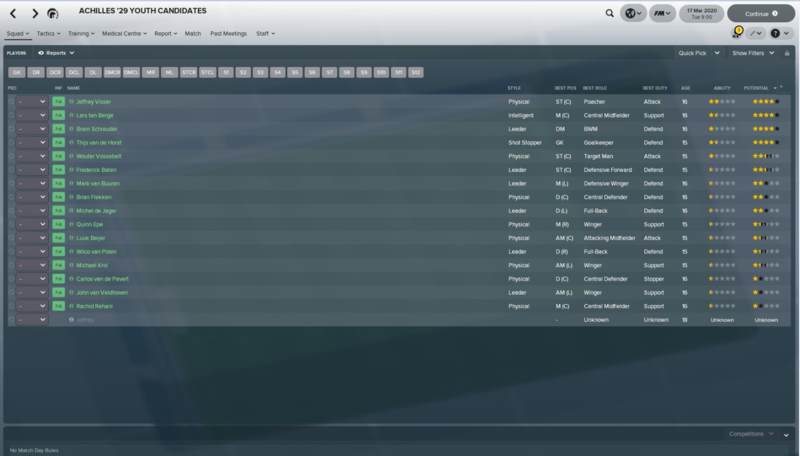 Team - Last years regens were very good, and with the continued improvements to recruitment and junior coaching, this meant, that this years regens in march entered the team directly starting at a previously unseen high level. Facilities - Further upgrades to training and recruitment facilities. The current level of recruitment means, that we should now in the coming season get some competitive players in our intakes. They should be on level with the players in most of the other top clubs and on rare occasions above. This is very good. 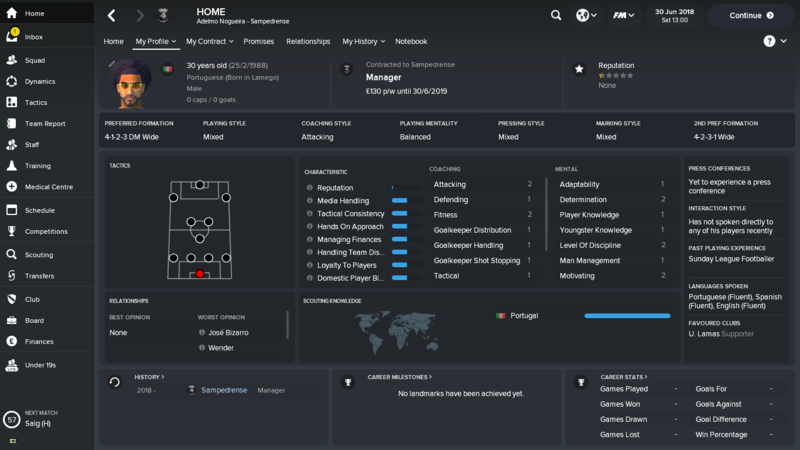 Finances - After going professional and upgrades to training facilities which cost around £1.1 mio. and will be complete in the new season, we still managed to increase our balance with £700.000. This is good, and leaves room for further upgrades to recruitment levels which should in time make us just a bit competitive in Europe as a start. 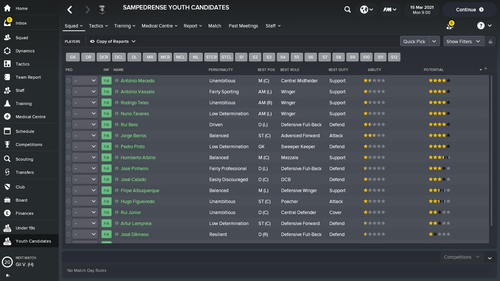 Youth Intake - Fantastic intake. Recruitment upgrades are really showing now. Stephen Reid went straight into our first team as clearly the best striker in the club at 16 and Raymond Gourley could be even better than our currently best goalkeeper David Fitzpatrick which we got from last years intake. 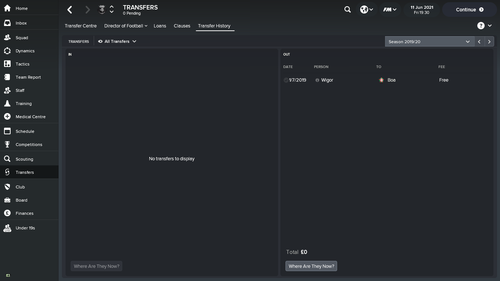 Goal: Keep status quo (winning the league) for a few years until we get more players from our improved intakes. This will cement our position nationally and hopefully get us closer to being competitive in Europe, which we are not currently despite our success. Outstanding work in Scotland, although Europe looks like it's a real tough ask! Any chance you have a screenshot of Stephen Reid? I'm interested as to what a 4* CA at Scottish Premiership level looks like! I've just had probably my quickest ever 'hit save now' moment in mine, with this beast coming through. I've badgered for recruitment and coaching upgrades all year, and even though the rest of the intake is average, I'd trade them all for Eltón! Sure. This is the Northern Irish Premiership level though. 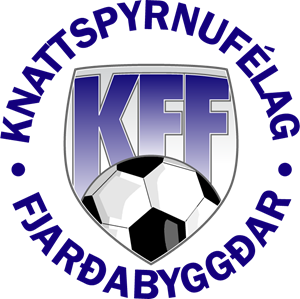 The competition is currently ranked just above the Scottish League 2 and 19 places below the Danish Second Division. So the players are a long way of Scottish Premiership level. 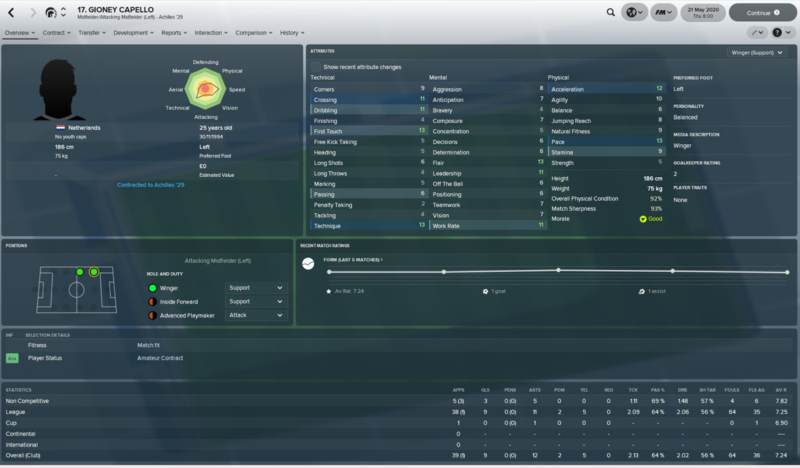 Stephen Reid is our new best striker at the age of 16. In a broad perspective, he is quite poor, but for Northern Ireland, and especially compared to my existing players he is a vast improvement, and I am looking forward to see his development in the coming years. 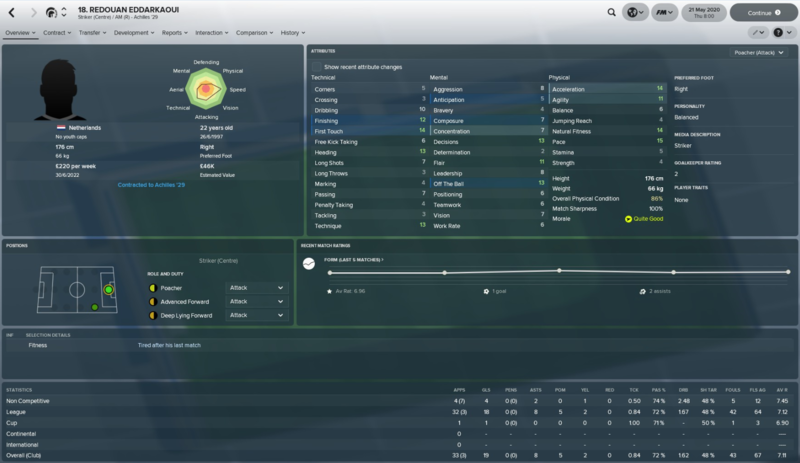 Raymond Gourley was the second very good regen with 4,5 stars in current ability. He is just about our best goalkeeper currently and certainly will be in the coming years. Oh wow, much more difficult than even Scotland then, no wonder Europe is so tough! Reid looks like he has good stats in the right places and should grow. Best of luck! N.B. I will hide images in links/spoiler tags if others wish, but it's far easier for me to upload and just embed like this when writing. 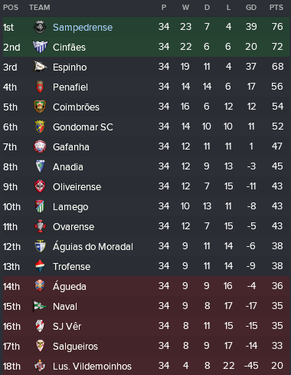 We played pretty well the whole season long and whilst Espinho and Oliveirense set the early pace, they faded for Cinfaes to challenge us later on. There was the odd heavy loss along the way, particularly when we didn't have any centre mids, but we only needed top two to qualify for the post-season playoffs (there are four leagues that eventually go through to two teams being promoted. 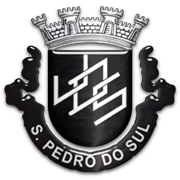 Along the way, I had my first interview offer (rejected - at Leiria) and we managed to get everyone to re-sign for next year (woop woop!). We drew Olhanense first (who had been a nemesis of mine the last time I was in Portugal) and made it through thanks to a superb performance away from home. Then came Oriental and the Elton Abdul (YP02a) show. He's not the most consistent player, but when he's on, he's a real matchwinner! The winners of each semi final earn promotion, so this was enough to see us up! In the final, a surprisingly straightforward game saw us beat league rivals Cinfaes comfortably. Lisandro Gomes (YP02c) - a very flexible defensive player who I'll probably play at CB. Andrei Moldovan - not sure whether he deserves a tag, so I'll just keep an eye. Weird attribute spread for a left mid. There was a definite step up in quality and whilst we had a very rocky patch in the middle of the season, our two strikers inevitably helped us eke out a few wins. There were some very heavy losses though, but in actual fact we were only two teams away from promotion as none of the B teams can go up. I think we will need a couple more years in this league as very few of our youngsters are good enough to even play at this level. I'm delighted to be out of that horrible playoff scenario though and this should be a good league to consolidate in. In terms of the facilities, I kept trying to push and attending one interview allowed me to get the board to agree to upgrade both Youth and Training Facilities. Sadly, they then cancelled at the end of the season due to them not waiting for the sponsorship money... Grr. 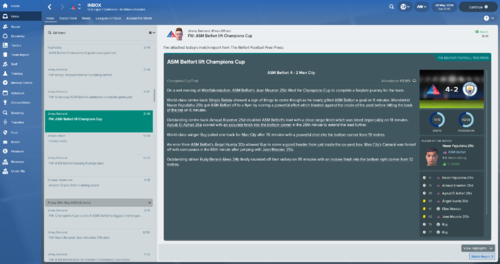 Cup - we dropped out of the Taca early, but made it to the group stages in the League Cup, which is just the top two leagues and saw us pick up some nice TV money as well. Looks great at first glance, but the actual players aren't as good as I would have hoped (and everyone on our team bar Mimba and Elton is pretty damn awful). Again, our best prospect is a striker, which isn't ideal as we have zero centre mids and an awful goalie... Two tags, possibly more in the future. Jorge Barrios (YP03a)- a good future strike partner for Elton Abdul and a solid third rotation option for now. Antonio Macedo (YP03b) - could be a good centre mid? I feel I'm clutching at straws a little here.